Sunday Brunch with bottomless drinks is becoming an institution in London. 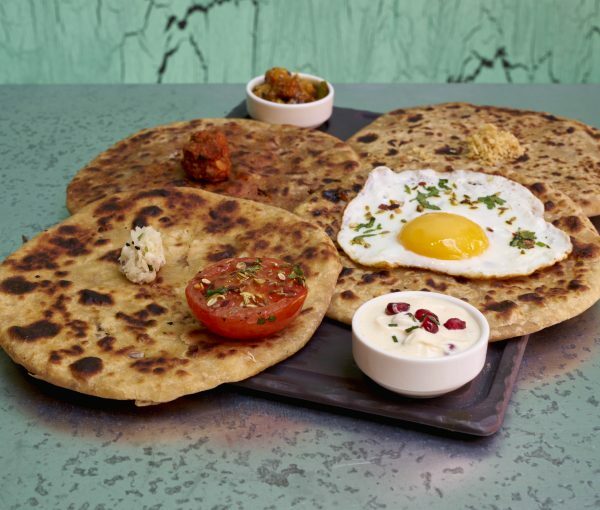 Par that with another English institution – Indian cuisine – and you have a recipe for lasting London success. 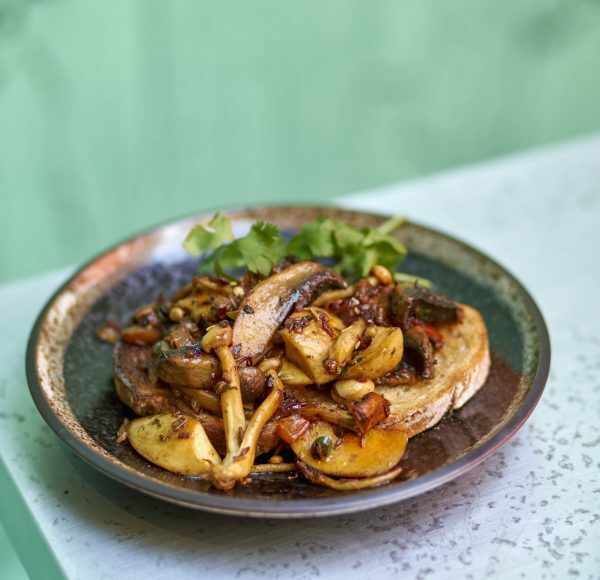 That is precisely what Cinnamon Soho, a sister branch of the Cinnamon London group, has set out to establish and so far, they are proving winners. 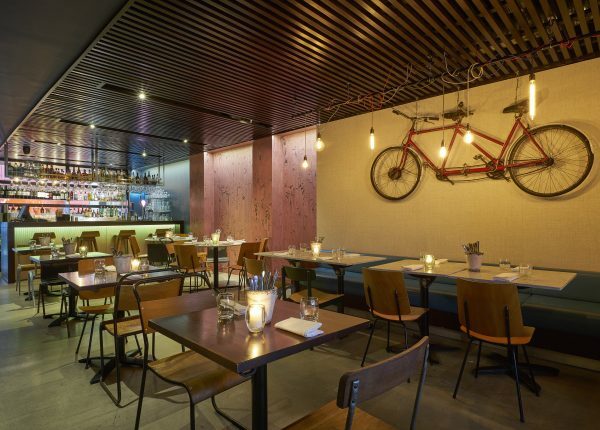 Offering a fusion of British and Indian cuisine in the heart of Soho, this restaurant opened in 2012 and offers all day dining of quality, seasonal cooking in a relaxed and informal atmosphere. With a small and intimate upstairs space, and a large, spacious basement area more fit for parties, the venue is a great addition to the flagship Cinnamon group as a cheeky hang-out with great food. 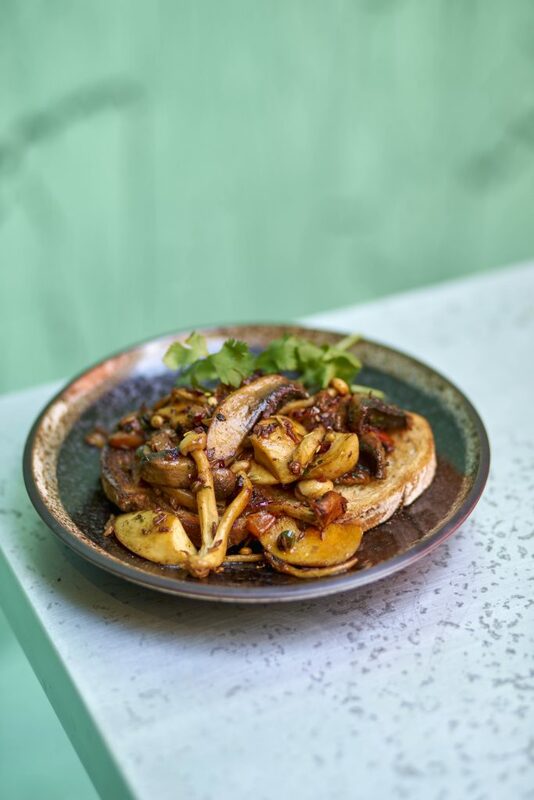 The group is inspired by head chef Vivek Singh, who draws upon traditional old-age Indian cooking to offer a ‘beyond authenticity’ experience of real India. His repertoire; three bestselling cookbooks, regular appearances on BBC’s Saturday Kitchen, Celebrity Masterchef and UKTV’s Market Kitchen, marks the quality of the food here and the high standard of experience. Every Sunday, from 11am – 5pm, the restaurant offers a ‘Unlimited Sparkling Sundays’, a bottomless Prosecco or mimosa brunch for two hours, at the extremely affordable price of £20. Hungover from a relatively heavy Saturday night, and starving hungry for some good soul food, my guest and I were itching to try Cinnamon Soho’s offerings. The Sunday brunch menu is small and succinct, which seems fitting with the brunch style dining (hungover and ravenous parties are less likely to want to peruse a ten page menu). Yet it offers a satisfactory range of English and Indian dishes that hit the spot. To start, our kind and helpful waiter suggested we try two ‘parathas’. 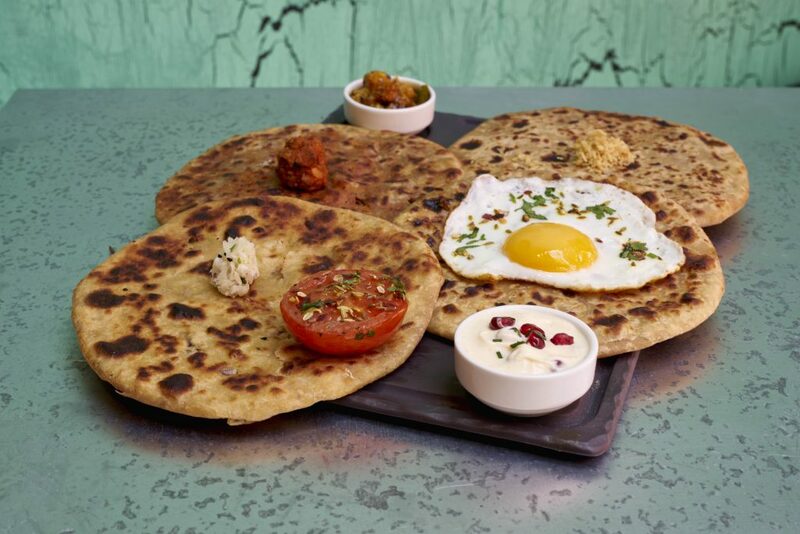 These are Cinnamon Soho breakfast specialities, delicious warm homemade flatbreads that come from the Indian subcontinent since the 12th century. Filled and cooked to a crispy edge, they come in various flavours and with a range of delicious dips. We went for the Gobi, a cauliflower and fragrant carom seed bread, and the Keema, which was a smoky spiced minced lamb version. Both were the size of a decent naan bread, warm, toasty, and excellent with the various dips. Other options include the Bollyflower Cheese (cauliflower and keene’s cheddar) and Aloo, a potato with a hint of chilli option. For the mains, we decided to indulge and tried four different dishes, though really, the sizes are decent and filling enough to warrant only two between two people. This isn’t a sharing dining experience (which probably makes sense, assuming again, a hungover and ravenous party). Inspired by the table next door, we first tried the Crab and curry leaf balls, which were delicious, crispy yet juicy and tender inside, balls of curried crab with various dips. Highly recommend these for all the crab fans out there – but you might want to order something more substantial if hungry. Though at £5.50 per serving, they’re a bargain snack well worth trying. For the larger dishes, we then tried (on the recommendation of our lovely waiter, again), the Tanjore style grilled king prawns with spinach porial and lemon rice. These were large and sumptuous, whilst the curry sauce that they came with was fantastic. We ordered two portions of peshwari naan (my absolute favourite) to mop up the sauces, which was just excellent. I’m an absolute sucker for peshwari naan, and Cinammon Soho’s version are no exception. We also tried the Biryani of Lucknow chicken with Burhani raita, which was a substantial portion of hot rice and tender chicken, oozing in creamy raita that was fantastic, and then finally finished with the Chettinand spiced grilled lamb fillets with curry leaf-lime salt. Personally, these were my favourite, slightly spicy, meaty fillets in a bed of warming tomato sauce based curry. Very, very good. For dessert (despite being stuffed, as always), we opted for the Bitter chocolate tartlet with an orange and mint salad, and the Chocolate Golis. These were small balls of chocolate chilli and white chocolate cardamom. My guest was all over the bitter chocolate tartlet, which was a dense dark chocolate tart finished off with a zesty orange note, and of a significant size for two. The Chocolate golis were my favourite, especially the chocolate chilli balls which were essentially a decadent chilli chocolate truffle. Perfect for sharing, and a portion large enough that we couldn’t finish (a rarity indeed!). All in all, an excellent meal and fitting end to a lazy weekend. 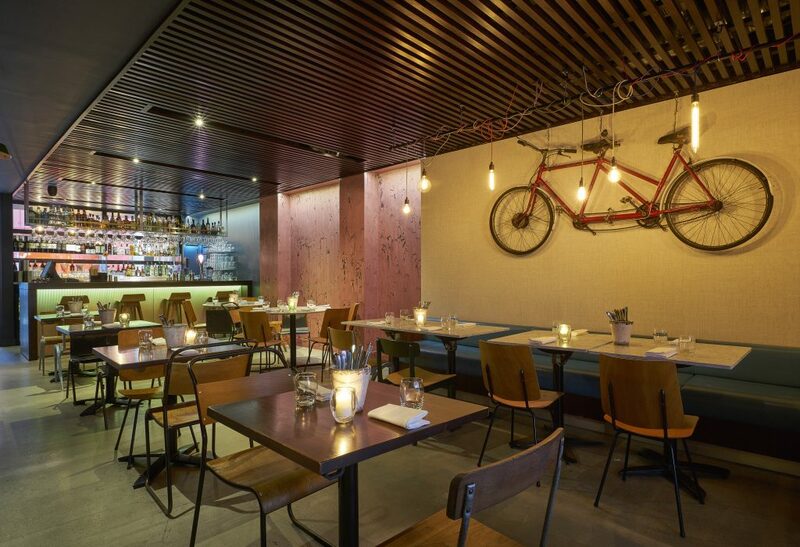 Throughout this meal, the Prosecco we enjoyed was particularly good for a ‘bottomless brunch’ deal; often one would expect a lower calibre of beverage when rendered bottomless, but Cinnamon Soho exceeded our expectations. This was a very dry NV Prosecco Spumante Extra Dry DOC, Ca’ di Alte, from Veneto, Italy (of course). Priced at £35.00, a bottomless brunch for £20 seems an excellent deal. 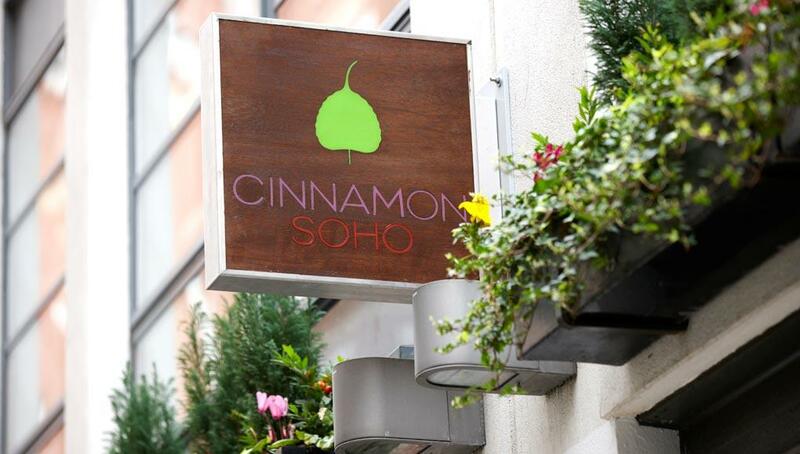 Cinnamon Soho, then, is a welcome and fresh addition to the Sunday brunch scene in London, that is well worth trying. For T&C’s of the Bottomless Brunch check out the menu online.